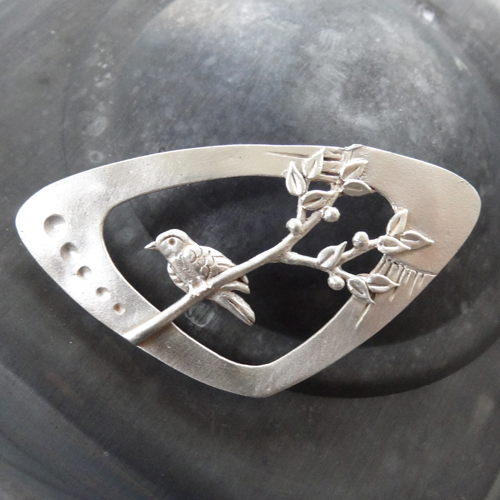 I'm rethinking my process for making jewelry, trying to get my head around the idea of components. This week I've whipped up a collection of small bits that I regularly make with the goal of making molds and casting them in Argentium for further use. These dull gray components just finished their first stage firing in the kiln to remove the clay binder. 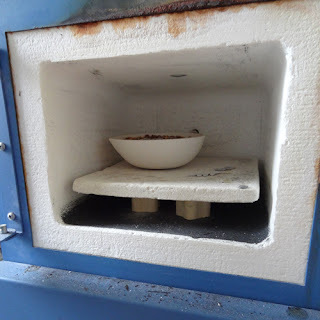 You can see I don't bother cleaning my kiln very often of the black dust that spalls off the stainless steel container. Flat items are fired on a fiber shelf, while curved pieces are supported in a bowl of vermiculite during this first firing. 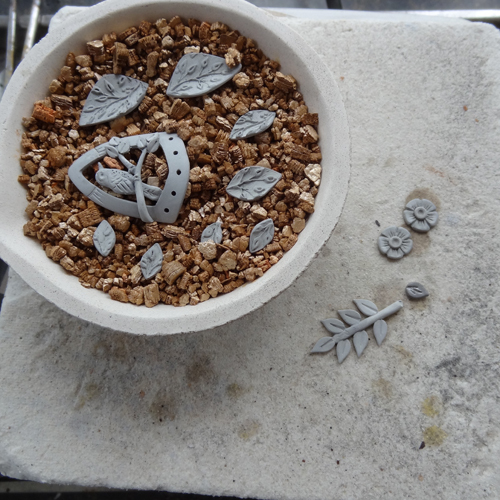 Notice the leaves already attached to a sprue built from clay. 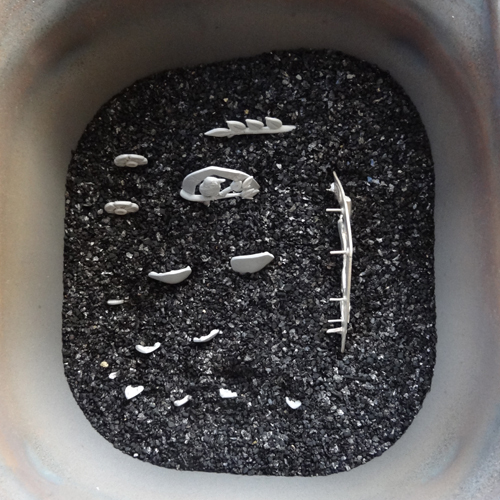 Next the items are buried in carbon to provide an oxygen free environment for the second stage firing where all the tiny silver and copper particles sinter together to make solid sterling. On the far right you can see a treetop brooch going in for a third round of firing to finalize a repair. Shown here on the blackened container lid, the brooch originally broke at a thin spot where I impressed the sun in the upper right corner. Despite building the leaves over the break and adding more on the back, the crack opened during the first carbon firing. Here, it has already been through a first round of repair with more clay added to fill the gap that opened. I've filed down some excess and added more in certain areas, and I'm sending it through again before I file the edge smooth and do the finishing work. I like to see that you fire your flat pieces vertically. That's how I do .999 clay, and might be why I had so much cracking with Goldie in carbon - I fired them flat. Next try will be vertical. Thanks Vic. Interesting...I fire everything flat. No troubles with silver, but the Goldie was a nightmare of cracking...I shall give this a try. Thx Vickie, and Lora for pointing it out. Hope that helps. I changed to vertical firing after having distortion when firing flat in carbon. I assume it's the weight of the carbon. I'd put in a flat brooch and it would come out wavy. There's still a little bit of that when fired vertical, but much less, a correctable amount.